Just a short walk away from the tourist hubbub around the State Opera House is Operngasse, a street housing one of the more famous of Vienna’s cafés: Café Museum was home to such artistic revolutionaries as Klimt, Schiele and Loos. The Café Museum traces its origins back to 1899 and occupies a special place in art history, thanks to the fellow who took care of the interior design. He was none other than Adolf Loos, one of the fathers of modern architecture. Loos’s unpretentious, simplistic approach proved a magnet to artists and intellectuals of the time. Loos himself was a regular guest, as was Otto Wagner, Gustav Klimt, and Egon Schiele. I imagine some of the sketches on left-behind napkins were rather intriguing (and would be worth a fortune today). Much has changed since then, of course. My first encounter with Café Museum came at the invitation of a friend, and left such a positive impression I passed on the favour by inviting another friend to join me there for breakfast. Much of that good impression resulted from the waiters and waitresses, who managed the delicate trick of combining traditional smart attire and service with more contemporary friendliness. The staff also mastered that arcane skill of appearing unhurried and unobtrusive, yet instantly available when required. I have no idea how this is done, though I suspect magic (and regular sacrifices of coffee beans to the Espresso Gods). They were fast, too – mere moments elapsed between ordering a Wiener melange and running a spoon through the foam topping. 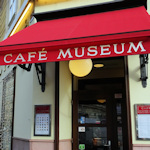 The first thing that strikes you when you enter Café Museum is the brash red and chrome coffee machines at the bar. It’s a colour combination that permeates the premises. Along the walls, for example, red upholstered benches form semi-circles around marbled cream tabletops, creating their own private niches without actually being niches. Even the little covers that ensure your breakfast egg keeps warm are red. Large silvery balls hang from the vaulted ceiling, while dark coffee house chairs complete the restrained furnishings. The design stems largely from a 2010 refit, but essentially returned the insides to the style and look of Café Museum in the mid-20th century. When you get to my age, these things matter. World peace? All very well, but what I really want is spreadable butter. The “Wiener” was just one of the many meals on offer. The breakfasts expand in size or variety in tandem with the price, all the way up to a “Naschmarkt breakfast” for just under €20. And you can get snacks, soups, salads, and full meals, too. As part of the Querfeld family group, Café Museum also draws on the in-house Landtmann patisserie, which is one way of saying there are some rather good cakes to go with your coffee. I’m not a sweet tooth, but I’ve had a fine Sachertorte there, and if you can’t choose, there is always the option of taking a trio of mini cakes (Sachertorte, Mozart cake and Raspberry Quark cake). The prices are not cheap – a cappuccino will set you back over €5. But the value of the top coffee houses is not measured in terms of cents and Euros. Plus you really do get to sit there for as long as you like (in my case, four hours with just two coffees). In summary, Café Museum is stylish, efficient and pristine. The only downside is that it might be a touch too stylish, efficient and pristine for some tastes, particularly if you’re looking for a more earthy coffee house experience. The coffee house is close to the State Opera House and Karlsplatz station. If you’re a fan of Viennese art and culture around the late 19th/early 20th centuries, then the Secession building is a few steps away, with its Beethoven Frieze by Klimt. And in the other direction is Otto Wagner’s famous station pavilion. Subway: If you take the U1, U2 or U4 subway lines to “Karlsplatz”, the “Operngasse” exit brings you out more or less at the front door of Café Museum. Trams and buses: Alternatively, it’s just a short walk from the “Oper/Karlsplatz” stop served by tram lines 1, 2, D, 62, and 71, as well as bus line 59A. At the time of visiting (January 2nd, 2019), open daily from 8 am to midnight.